New digital upstarts are threatening the bottom lines. Even growth prospects and traditional business models are now being threatened. Incumbents are receiving persistent demands from the market to innovate or be left behind. The service landscape is changing. Companies are now being caught in the midst of a changing service landscape that requires innovative shifts in approaches and systems. Being unprepared can be detrimental to the company’s business continuity. Companies must strive to keep afloat. This can be done when companies learn to retool themselves can they remain competitive during the new industrial era. We are at the beginning of a revolution that is fundamentally changing the way we live, work, and relate to one another. Coined by the Word Economic Forum (WEF) in 2016, the Fourth Industrial Revolution (4IR) is the fourth major industrial era since the initial Industrial Revolution of the 18th century. The Fourth Industrial Revolution (4IR) is fundamentally different. It has a range of new technologies that are fusing the physical, digital, and biological worlds. It is impacting all disciplines, economics, and industries. It is challenging ideas about what it means to be human. Service businesses are now under threat. There is a new wave of digital upstarts that capitalize on changes in technology, customer behavior, and data. Available data is now creating innovative, customer-friendly alternatives to the services companies offer. Four evolving trends has revolutionized the New Service Landscape. There are now higher customer expectations. Customers now demand greater involvement, customization, personalization, and mobility from services with immediate results. All industries are now expected to have cutting-edge service innovations. The rise of the mobile internet. With the rise of mobile internet, growth opportunities, reduced cost of developing services, and lowered barriers to entry have been unlocked. Companies now have access to big data and advanced analytics where insights from massive, previously untapped sources can now be drawn. The Internet of Things. With internet, real time service delivery in B2B applications can now be facilitated. Companies can now create proactive, touchless services and new commercial models. The evolving trends have shifted dramatically the nature of service and the pace of change that is evolving. Today, mastering the traditional aspects of service delivery will no longer be enough. Companies must continue to keep watch of evolving trends to remain upfront in terms of competition. There is now the urgent call for breakthrough actions. Companies must need to redefine service offerings, harness digital technology and improve customer experience. 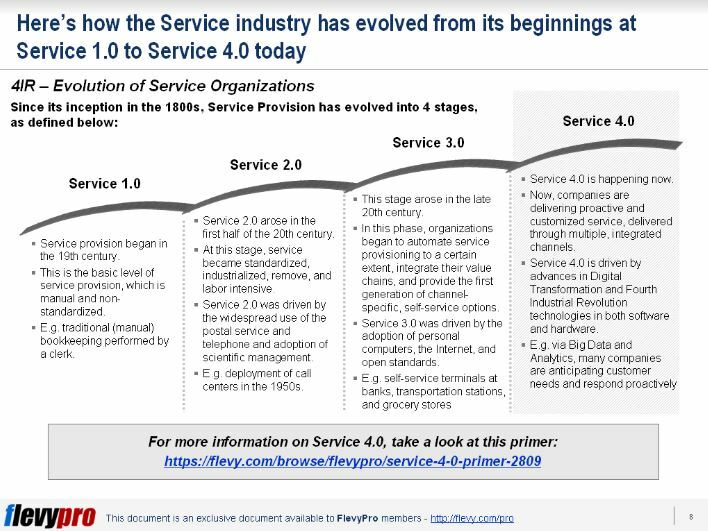 The Service Industry has evolved from Service 1.0 to Service 4.0 today. The benefits of mastering the shifts in Service Innovation is significant. Companies must realize that services account for ¾ of global growth. Those that can evolve quickly are in a better position to capture this growth. However, traditional companies may face certain dilemma. Unable to meet the new service landscape can result into traditional companies facing growing pressures from digital attackers. 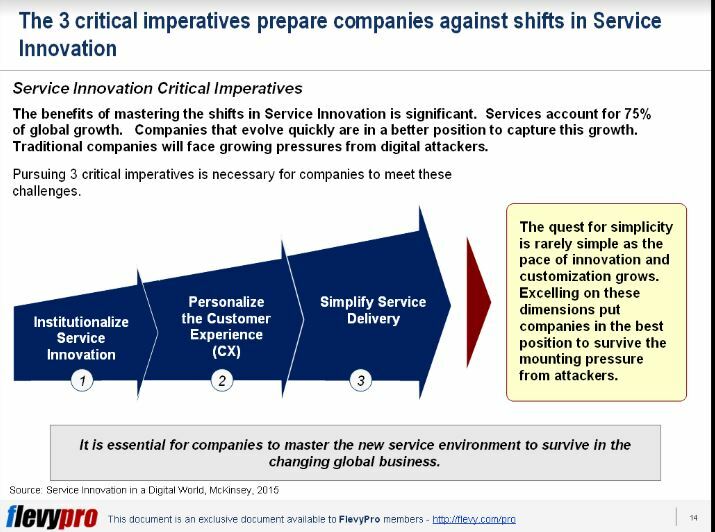 There are 3 Critical Imperatives that can prepare our company against shifts in Service Innovation. Pursuing these imperatives will prepare our company against any challenges we that we meet during the 4th Industrial Revolution and allow us to undertake our own Service Transformation. Institutionalizing Service Innovation can build corporate’s capability to come up with creative solutions. Services, like products, also have a shelf life. Customer demand evolves, service expectations change, and technological advances constantly bring new possibilities. It is therefore important for service to be periodically examined and refreshed. Traditional companies focus on customer segments to understand customer needs better. However, personalizing customer experience can direct companies to achieve market leadership. 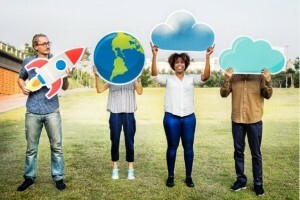 With massive new datasets and mobile device, services can now be personalized cost effectively to a much higher degree. Partnership with retailers can be forged to create personalized, real time discounts for products and services through a mobile app. Companies can collaborate with social media players undertaken to draw on the preferences of participating customers. Simplifying service delivery is the call of the 21st century customer. Digital attackers now tend to thrive on simplicity. With new technology combined with process improvement, it makes services straightforward and more pleasing. Simplifying service delivery systems enhance operational productivity and enrich customer experience. Service 4.0 is revolutionizing service to meet changing consumers demand. Being unable to evolve with the new service landscape can spell a big difference between business continuity or closure. Interested in gaining more understanding on how to achieve an effective Service Innovation? You can learn more and download an editable PowerPoint about Service 4.0: Service Innovation here on the Flevy documents marketplace.